Debbie – Owner and stylist Debbie has over 20 years of industry experience and specializes in hair color and color corrections, hair extensions and SofTap Permanent Cosmetic application. Debbie has worked and trained with some of the best colorists in the world and has never met a color problem she couldn’t solve. April – April has over 20 years of professional styling experience and provides a full menu of hair care services for men, women and children. April specializes in texture services like keratin smoothing treatments and perms, and creating formal hairstyles for weddings and other occasions. Jackie– Now in her third year at Salon Oggi, Jackie provides hair care services for women, men and children including haircuts, color, blow outs, smoothing treatments and perms. Jackie is also certified in hair extensions and full body waxing. Melinda – A former educator for Paul Mitchell, Scruples and Aquage, Melinda has over 20 years of styling experience. In addition to haircuts and coloring, Melinda does hair extensions and creates beautiful hairstyles for formal and special occasions. Vicki – An industry professional with over 20 years of experience, Vicki’s salon services include haircuts, color, perms and smoothing treatments. Vicki also does manicures, pedicures, shellac manicures, paraffin dips, and makeup applications. Doug – Doug has several years of styling experience and has been at Salon Oggi since 2011. A talented and versatile stylist, Doug provides men, women and children (including several entire families) with hair care and styling. Lisa – Lisa is a stylist with over 5 years in the cosmetology industry. She offers hair cuts and styling to men, women and children and specializes in color and color correction. Thao – Thao has offered hair services for over 9 years and caters to men, women and children’s hair. She creates beautiful blow dry styling and also specializes in ombre color, balayage color, and formal styling. Rachel – Rachel has been a hair color expert for over 12 years. She specializes in ombre, color paneling, European highlights, and color correction. In addition to color, she offers women’s cuts, styling, updos, and microbead extensions. Thelma – For over 12 years, Thelma has perfected formal styling. She also specializes in color and offers cuts to men, women and children, perms, keratin treatments and waxing. Lisa – Lisa a certified make up artist and skin care specialist offering a wide range of spa services. She specializes in air brush and traditional make up, facials, and waxing. She has over two years in the industry. Tanja – With over 20 years experience in the industry, Tanja has perfected nail care. She creates beautiful long lasting looks with acrylics, and also specializes in manicures and pedicures. She also offers Shellac manicures and pedicures. Andrea – Andrea has been with a Salon Oggi since opening, and a stylist for over ten years. Her specialty services include eyelash and eyebrow extensions, semi permanent mascara, and creative color. She offers hair care services for men, women and children, and enjoys special event styling. 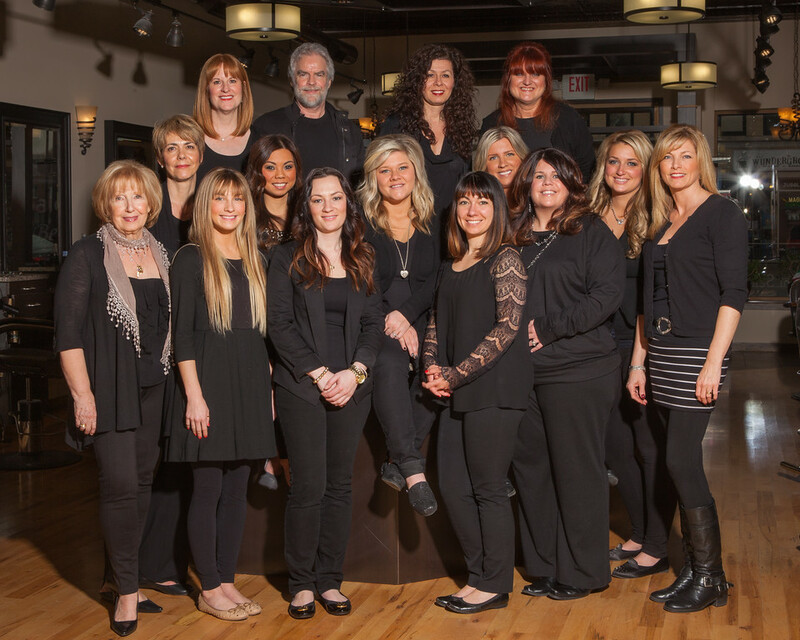 Connie – Connie has perfected hair for years and enjoys creating complete makeovers with cut and color. She creates color of all kinds and also offer cuts for men, women, and children, and evening designs. Elaine – Elaine offers a full variety of hair services and specializes in styling fine hair types, as well as color and cutting for all. Her years and professional experience in the industry shine through her work. Amber – Amber has over 13 years experience in many aspects of hair. She creates beautiful color in ombré styles using the balayage technique. Amber offers color and color correction, blowouts, formal styling, women’s, men’s and children’s haircuts, waxing and micro bead extensions.